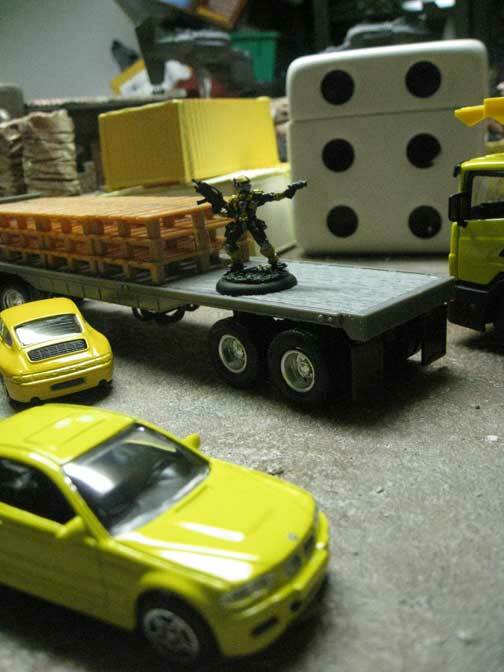 Deadzone – Recently I read a battle report for the Judge Dredd game over on the Warlord website. 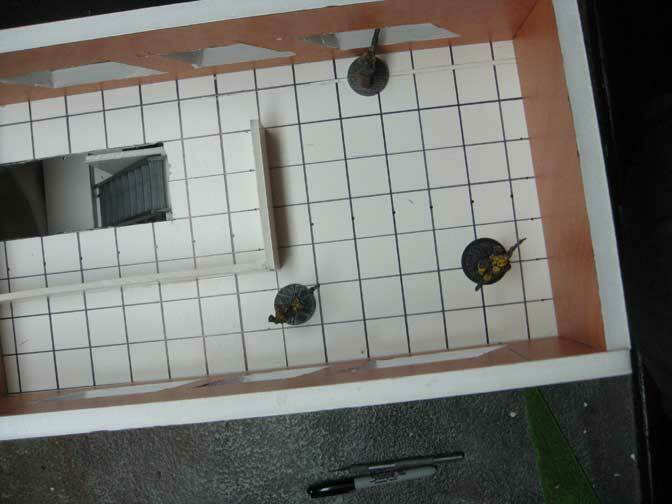 The photos included some of the Deadzone Terrain. Shortly after reading that report I listened to the D6G podcast that reviews Deadzone. It seems fate wants me to do something with my Deadzone stuff. Deadzone – Felling a bit under the weather lately, between the terrible winter weather and the unending rounds of sniffles and colds I was able to squeeze in some painting. To match my current mood I decided to start off my Deadzone series with the Plague. I'm not totally in love with these models but they did seem to be the simplest of the four factions I have to get painted quickly. The studio scheme is a little to pink for my taste so I opted for a sightly more gruesome appearance. 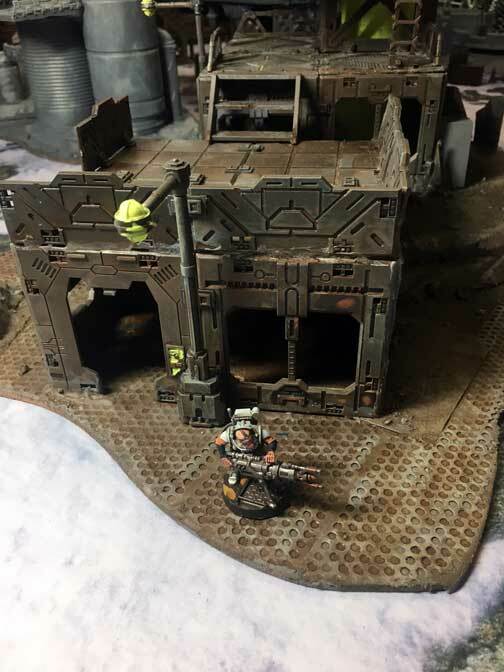 Deadzone – After such a stretch of 40K I need a break on the hobby end of things so I decided to start putting together the contents of my Deadzone Strikeforce bundle. All the little plastic baggies in this remind me of the original Super Dungeon box set. The models go together the same way round peg round hole, weird t-shaped peg weird t-shaped hole; so putting them together is pretty easy if you only open one bag at a time (a lesson I learned from the Super Dungeon Box). Clean-up on the other hand is a pain. The mold lines and sprue pegs on theses models are pretty nasty, even those most of them come "de-sprued" you're still going to need your side cutters and x-acto blade. I started meticulously cleaning these models and got frustrated enough that I just glued some together. It's probably going to be harder to clean them up post-assembly but at least I was able to see some progress. Other than the weird placement of some of the mold lines (really the middle of a dude's face is the best spot for this?) the models are pretty nice. The details look a little soft in some of the models but I have a feeling once paint is applied they'll look really nice. I haven't decided if I'm going to go all out with these or treat them more like a board game. The rules and size of the play area seem to lean more in the board game direction so I might just get them to tabletop quality and be done with it. When it was all said and done I was only missing one arm and had a few broken arms/blades. Which isn't too bad when you consider that the models were just packed in plastic bags thrown loose into a giant box and shipped from China or wherever they were cast and packed. Kickstarter – Holy Crap! A Kickstarter delivered early this must be a Christmas Miracle. I arrived home to find this massive brown box on my porch last week. I didn't get a chance to dig into it until now but after opening it up look what I found. Deadzone Box Set – The box is huge. I'm impressed with what they were able to fit into this box. I'm not sure that this will be the same as the general release but the one box held EVERYTHING for the (4) factions included in the Strike Force Pledge. It sounds like there is still some additional stuff that will ship later with part two. Anyone who put together the original Super Dungeon Explore minis with be familiar with the massive amount of baggies with models and parts sealed together. At first glance it appears these models have unique pegs that will only fit certain holes. 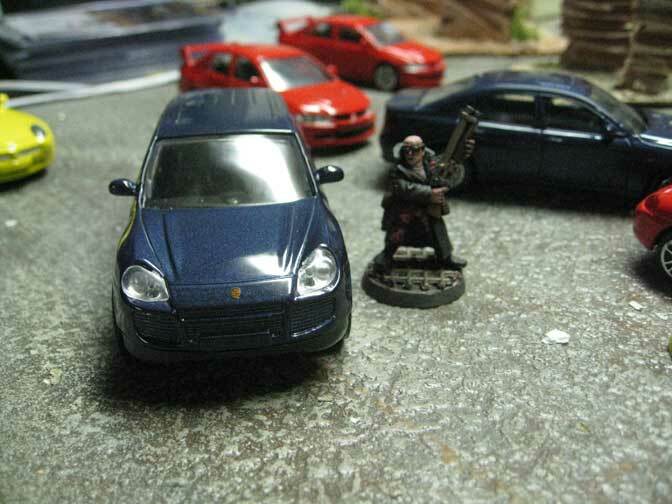 Nifty for the board gamer kind, kind of a pain for the modeler. These are not polystyrene plastic models so you'll need to use super glue to put them together, plastic glue won't work. (One of my biggest pet peeves ... if you call them plastic models plastic cement should work ... they really need to call them something other than plastic). The rulebook is nice and in full color. It's a little thin but at first glance it seems to cover the fairly simple ruleset and gives a good introduction to the universe. Faction Starters – Tons of baggies. 4 Decks of Cards. The overall quality of Mantic stuff is pretty consistent, for the most part you know what you're getting yourself into if you've ever bought anything else from them. Not quite GW quality but then again not quite GW cost either. You're either a fan of this stuff or not there's not much room for fence sitting. Personally, I hate Mantics base system and really wish they'd use something other than a disk of plastic on the models base. If you want to use any fancy resin bases the size will be off by a little and you'll have to figure out how to remove the models from that chunky base. It all looks positive and the rules seem simple enough that in a few years my son will be able to play the game with me. Or some simple version of it. For this board I'm trying to get each piece to a semi finished state to play some test games before I move into painting. Because something that looks cool and fits the models doesn't necessarily mean it will be a fun piece of terrain to play games on. My major concerns with the apartment building lie with models moving around inside. While it was easy enough to build the floors to be stackable and removable, I'm not sure how much scatter terrain is needed inside the building. Sure it will look cool to have it fully furnished, but will it hinder gameplay? One of the issues I have with all the laser cut MDF buildings that have popped up in the market as of late is the last of interior details. If this is an apartment complex, how do you get to the second floor? Catwalks on the exterior of the building are pretty inefficient and unlikely, unless the buildings are scavenged together from junk. Sure it makes for decent cover and what not, but then so does just building a bunch of random shapes like a paintball field. Not exactly realistic (in a game with alien soldiers wielding chainsaws and laser guns realism is key ... right?) which for some reason bugs the hell out of me. To attempt to solve this I build a stairwell within the apartment building. It took a bit of trial and error but eventually I found a location that would be easy to move standard human size models up and down as well as be able to replicate the firefights that happen in said stairwells all the time in movies. 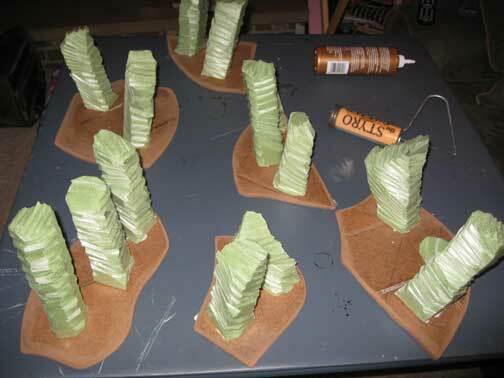 Terrain – I spent some time working on the club terrain piece for my near future board. After constructing the walls I realized this was going to be a rather bland structure since it has no windows and only one entry point. The interior is fairly interesting with several height variations leading to the private rooms and stage as well as the main entry check point/bar. To add some additional interest to the building exterior I've cut some strips of lightweight cardstock into "futuristic shapes" (yes that means variations on hexagons...) While I was cutting strips Empire Strikes Back was on Spike so I gleaned a little inspiration from the set pieces in the film. Most of the futuristic feel of the set comes from the various panel shapes in the background. I also have been paying more attention to newer commercial buildings and noticed most of them use something called efface for the exterior. Essentially what that means is the exterior walls are covered with a foam product skinned with concrete, this allows for interesting shapes at a low cost. Taking these two points of reference I've added quite a bit of exterior detail that will bring out interest areas without resorting to the typical rivets everywhere look of some futuristic terrain. I also created the removable roof. Initially it fit a little to snug, after trimming the paper backing off the foamcore on the interior side it is now easier to remove and shouldn't cause to many problems lifting off during gameplay to place models inside. For the large sign on the exterior I opt to go with a silhouette and a large billboard. I'm still contemplating how I want to do the name of the club. Most likely I'm going to cut out the letters and paint them like neon but I'm still on the fence. For the actual name I'm leaning towards "The Slippery Kitty Lounge" this seems to be a solid name that will fit in numerous settings. The roof needed quite a bit of detailing. Because the structure takes up a significant portion of the 3'x3' board, I have a feeling the rooftop is going to be a popular perch. Because of this I added some HVAC units and other structures to the roof to provide some cover. Ideally I don't want the roof to be just a sniper's nest but an area that could be contested by several models without becoming a no mans land if there is a model at a higher vantage point. 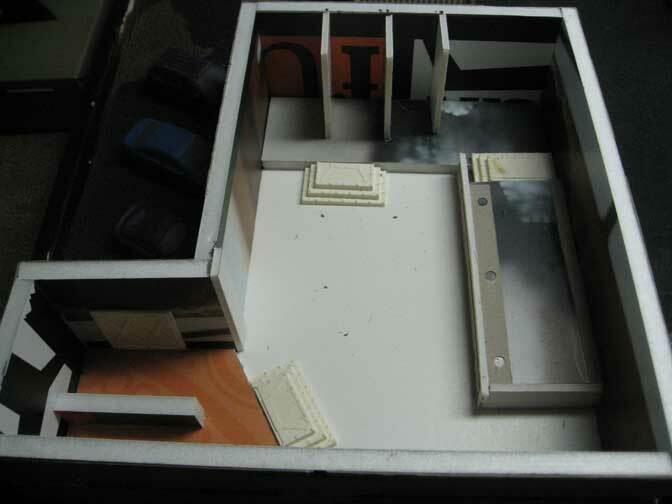 The HVAC units were made from some Platformer parts I had laying around as well as some other bitz. I still have some other details that need to be figured out before I can move onto painting this building but at this point I think it's ready for a test game to be sure it works as intended. Terrain – I've begun the groundwork for my near future board. After doing a few sketches and looking at the large amount of laser cut terrain available in the market today I decided to pull some inspiration from these designs. 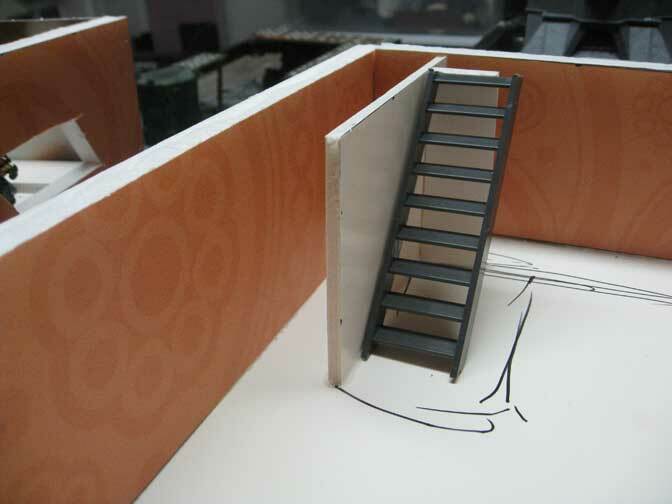 While I really like the look of the laser cut mdf I can't justify the cost when I can build eactly what i want myself. Sure it might be easier to just buy and glue together a kit (probably will go that route in the future...) but I'd like to build everything from scratch for this board. After laying out some paper shapes on my Zuzzy mat I got a rough idea of what type of layout I wanted to create. My thought is to create a slum/industrial area and I drove around Detroit for some inspiration. In many seedier neighborhoods you have truck depots/shipping yards that but up against residential areas and also feature some of the less desirable businesses. For my purposes this is going to be the ideal battleground. 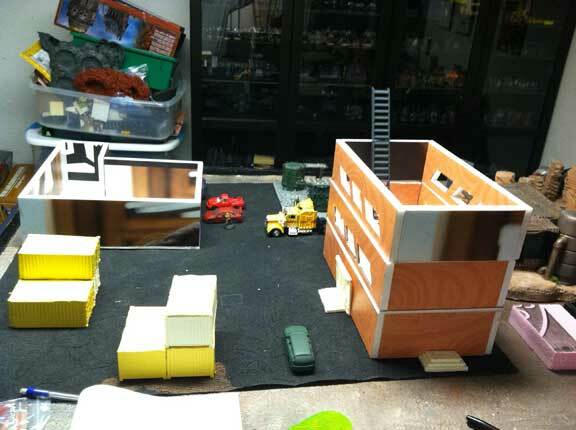 The structures I have planned are a three-story apartment building, liquor store, gentleman's club and a fenced in shipping yard; combined with the variety of 1:43 scale cars I've found I'll be able to detail out the neighborhood easily. 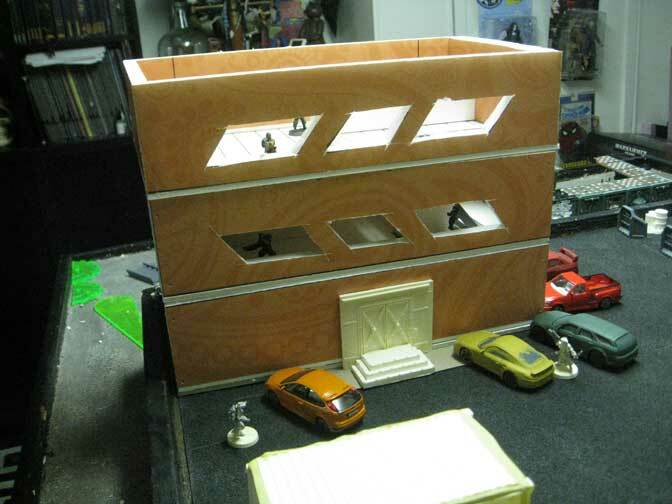 The first step was determining a size for my buildings as there are several different systems I plan on using this board for it was important to make sure the scale made sense for everything. In MERCS the movement cards are about 3.5" long, so I used that as my basis for the height of a standard wall, this way it's easy to determine how many MP it takes for a model to ascend a level. Most other systems have 4"-6" as a standard move so this size will work with them as well. I happen to have a bunch of 1/2" gator board that I saved from a dumpster (technically) which I decided to used as the basis for my walls. The nice thing about gator board is it has a styrene skin which holds up better than paper. This board is very dense and provides a sturdy foundation for the walls, especially when cut down to small sections like these buildings. It is however difficult to cut as the plastic skin is so durable it will take a few passes with the blade before you get to the foam. After messing around with a few designs I came up with a look I like for the apartment building and have begun cutting out the windows and cutting cardstock to detail the exterior of the building. I'm going to give the impression of concrete formed material with some geometric patterns. I think this will look futuristic enough without going over the top. I also cut out the walls for the club. I went with an "L" shape that can break up the table in some interesting ways. My plan is to fully detail out the interiors of these buildings and add removable roofs so you can easily enter and exit them. Next steps are to continue detailing the building exteriors and devise a method for stacking them that won't be to difficult to remove during game play. I decided to begin work on my Near Future board. Well, not really the board itself but rather some of the scatter terrain. 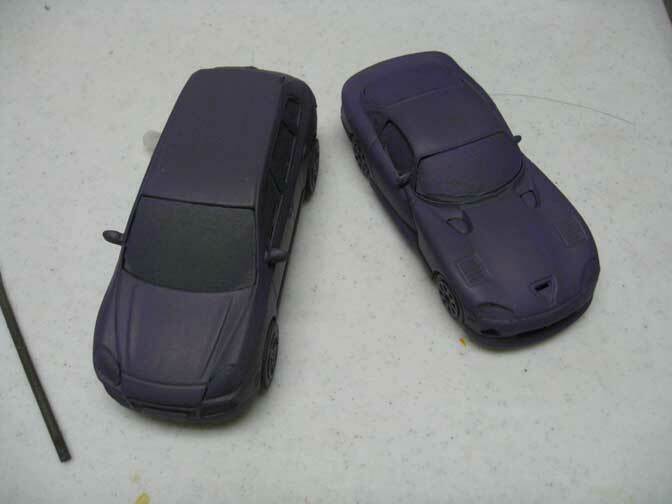 With all the cars I have laying around now it makes sense to begin the repaints so they match up with my style of painting. While I suppose I could just dip them in stain and call it a day ... that's not really my style. Step one is to mask off all the windows and headlamps. I like how the clear material looks and don't want to loose that with the repaint. So I dug up some blue painters tape and began the tedious process of masking and trimming each window. It's not a difficult process however it takes time and patience to do it right and not scratch up the plastic with my blade. After trimming them up I sprayed each car with Duplicolor Dark Gray primer. I really like this stuff it drys fast and smooth giving me a nice surface to paint. I've decided to recreate some of the cars I've pimped out in Saints Row 3. I really like the purple and silver scheme of the protagonists in that game and think it will add some much needed color to what could be a rather bland board. (most urbanscapes have this boring gray tone which I want to try and avoid this time around). I'm also working with some Laser Decal paper to try and figure our how to tint the windows out. I'll probably add some of the decals to the windows as well to call out and personalize the cars similar to what you see in urban neighborhoods. MERCS – I've been working on building a dedicated MERCS table. Currently I'm feverishly working on building a massive amount of ISO shipping containers. 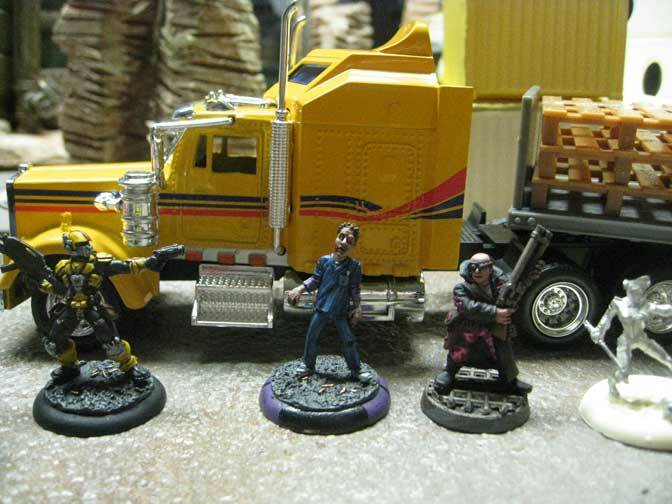 My goal is to have at least ten of these built and painted for games of MERCS. What I like about these is the versatility they provide in setting up a table. They stack easily and can add a level of elevation that is consistent and simple. With MERCS using cards to measure it becomes tricky to use more complicated terrain as you can't get the card inside of buildings or around corners etc. To go with these I've picked up a Zuzzy mat. These are really great if you don't have space to store a full size table. The mats are nicely detailed and fairly simple to paint.